Let the Right One In is a brutal and tender vampire myth told through the turbulence of a coming-of-age romance. Oskar, a lonely boy from a broken home, is bullied at school and longing for friendship. Eli, the young girl who moves in next door, doesn’t attend school and rarely leaves home. When a series of mysterious killings plagues the neighborhood, these two young misfits, sensing in each other a kindred spirit, forge a deep connection. But the shocking truth about one of them tests their young friendship—and love—beyond all imaginable limits. Recommended for adults and fearless teenagers age 13 and up. 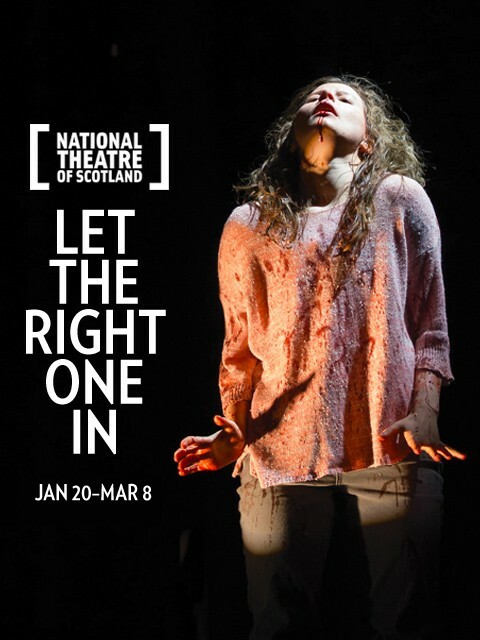 A National Theatre of Scotland production presented by arrangement with Bill Kenwright and Marla Rubin Productions Ltd, and in association with piece by piece productions; with additional funds from The National Endowment for the Arts, The New York Theater Program of the Andrew W. Mellon Foundation, NYSCA and the NYC Department of Cultu­ral Affairs. Killingly staged by John Tiffany and Steven Hoggett…the most compassionate of vampire stories…Eli is a feral creature, as amoral as a wolf cub, and yet possessed by a sad, all-too-human knowingness. She manages to be both completely un-self-conscious and equally, tragically self-aware. Extraordinarily imaginative…the play contains one of the single scariest moments ever seen onstage. Yet at its heart, LET THE RIGHT ONE IN is a stirring love story. LET THE RIGHT ONE IN is about kids in great danger…thrilling and terrifying—just like childhood…Benson gives a performance of awesome vocal and physical versatility: angelic calm giving way to frenzied carnality. A romance and a fairytale and a thriller and a chiller and a pretty thoughtful meditation on difference.